"And then there was Mondo, a cannabis powder derived from cacao butter and coconut oil that's gunning to become an all-natural Xanax. Whenever I dabbed a little on my tongue using the . . . "
"What I’m really obsessed with is how versatile of a product it is. I've tried plenty of cannabis edibles in my time, but I rarely cook with it myself. Because . . . "
"When Proposition 64 passed last November – which legalized adult-use recreational marijuana in the state of California as of January 1st, 2018 . . . "
".....but the best thing about Mondo is its versatility: It dissolves perfectly into liquids and has a fairly neutral flavor that allows it to be sprinkled on top off . . ."
" . . . I’ve found a new way to start my day and this magical little jar from Mondo Meds makes it possible." " Move over, $38 Moon Juice dust, Mondo’s dissolving cannabis powder has its own magical properties. Made of a handful of ingredients that include organic . . ."
"Then there's the array of edibles: Emily's Mondo powder comes in a chic little jar with gold lettering. It actually makes a virtue of the taste of cannabis, it's easy to use . 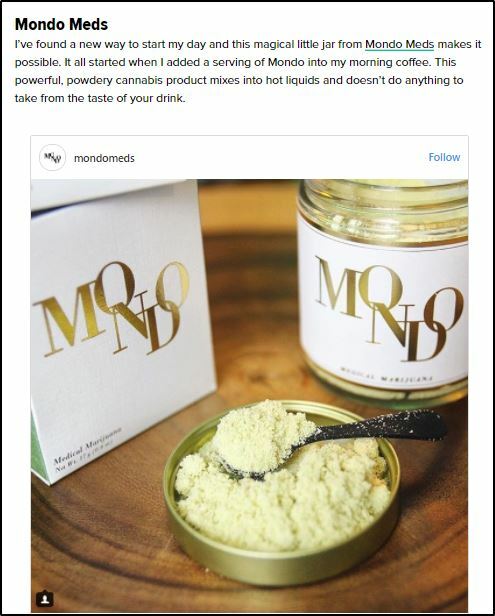 . ."
"Mondo is an all natural dissolving cannabis powder. A fast-acting edible, this gentle and functional high is the perfect accompaniment to productive lifestyles. Crafted from the highest quality flowers grown from a single source organic farmer, this product . . ."